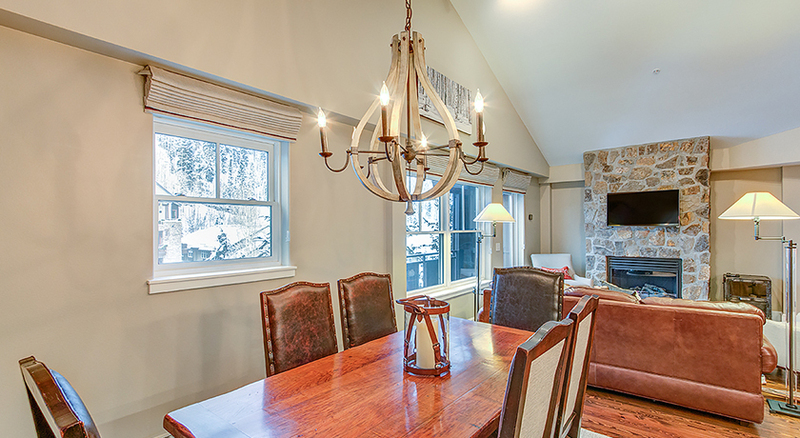 The River Club offers an upscale Telluride lodging experience. 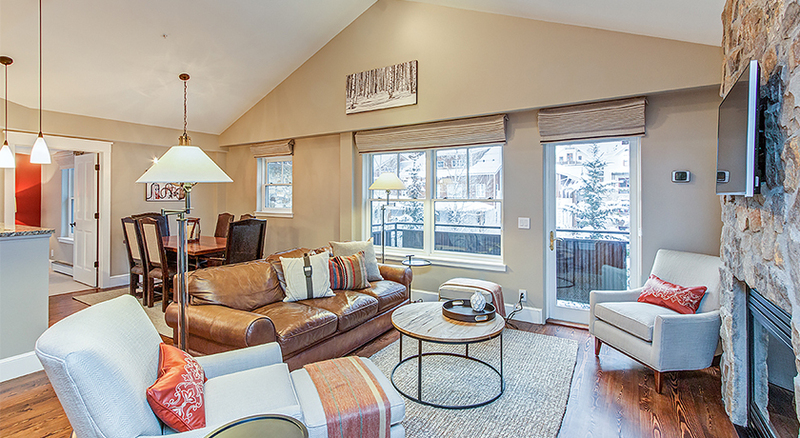 Telluride Alpine Lodging has the privilege of offering the same upscale experience that The River Club members receive to discerning guests at competitive prices, for either 2-bedroom/2-bathroom or 3-bedroom/3-bathroom apartments. 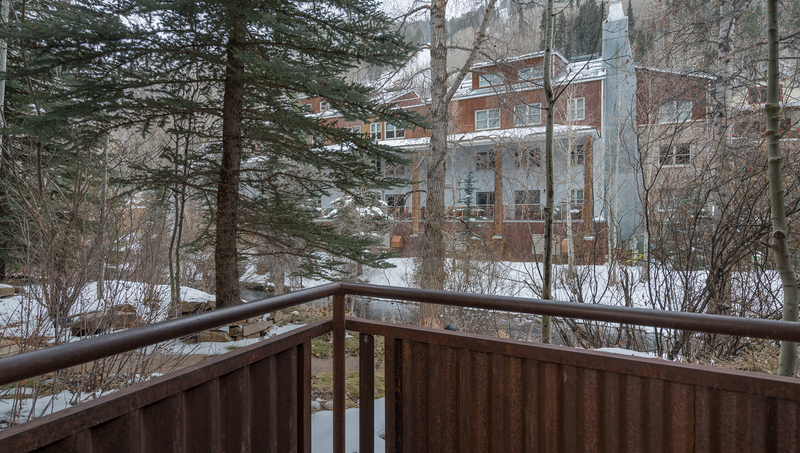 The River Club is located along the San Miguel River and is the only full service Telluride condominium property within the town of Telluride.Blocks from the free Gondola, lifts, shops, and restaurants, guests will receive the comfort of a first-class Telluride condominium and all the features of a full-service hotel - at one of the best locations in town. 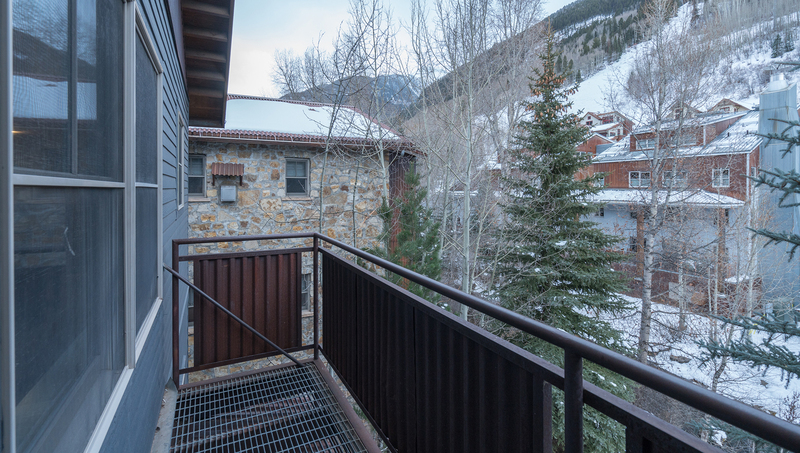 Stays include concierge service, valet parking, in-town transportation,Telluride Airport pick-up, wifi internet, and full access to the fitness center, garden waterfall hot tub, club room, kids' recreation room, ski/snowboard valet storage and boot dryers.The condos are appointed with the latest styling, fireplaces, fully equipped open kitchens, dining area and living room, large flat-screen HDTVs. Fine linens and plush towels grace the bedrooms and bathrooms. Each unit has its own washer and dryer. 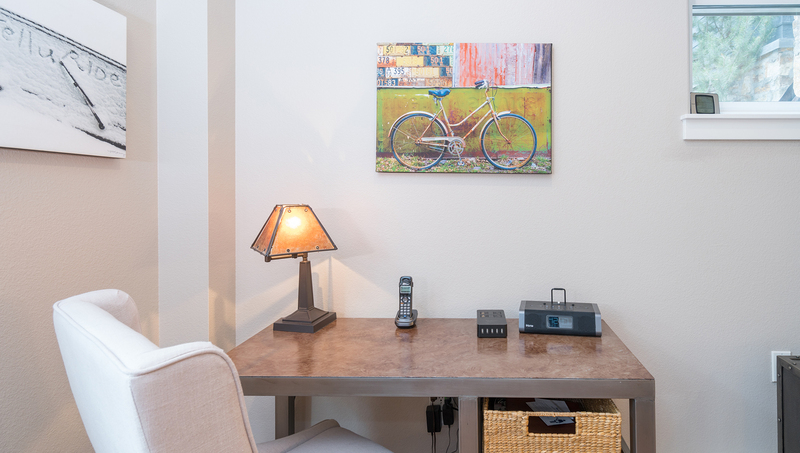 Weekly housekeeping is part of the stay, with additional services available a la carte.Bedding includes combinations with king, queen, or 2 twins for each bedroom. 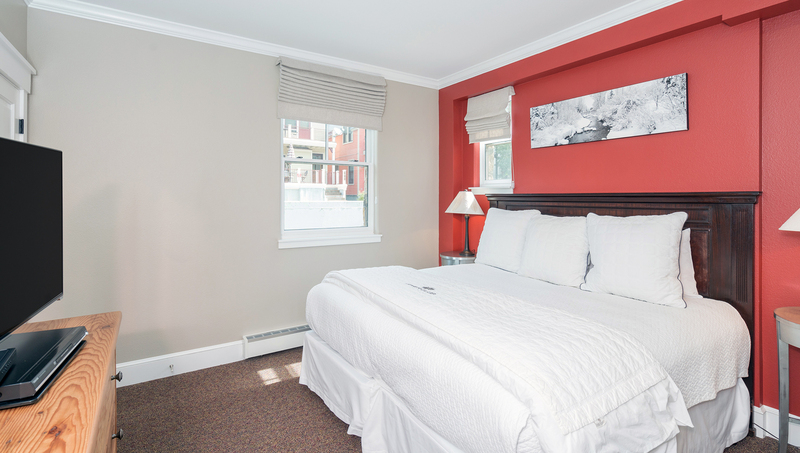 Though specific units cannot be reserved in advance, bed arrangement requests can be met. Balconies, cribs, and pet-friendly condos may also be available. 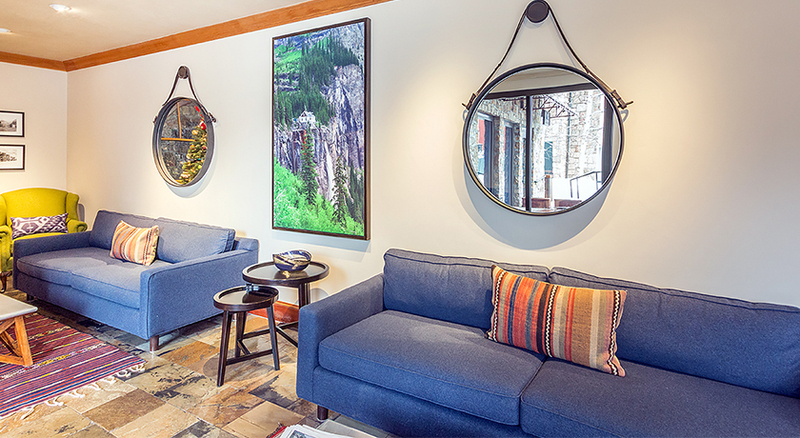 The only full-service residence club in the Town of Telluride, the River Club provides 5-star service for your Telluride stay. 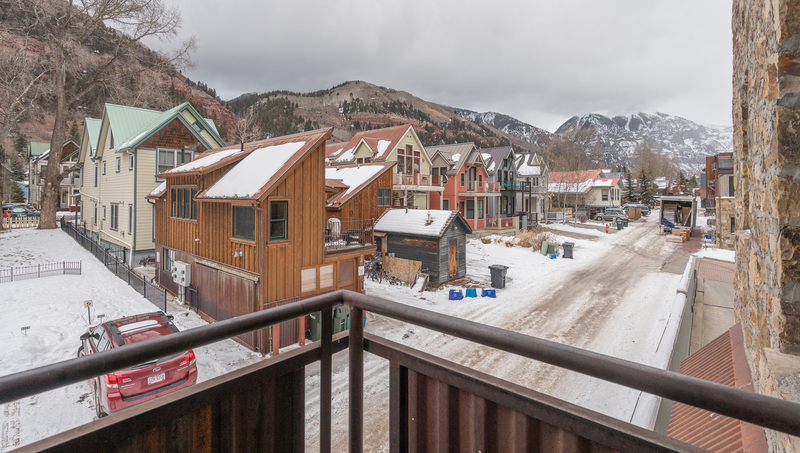 This 2-bedroom/2-bathroom residence has a great in-town location and luxury amenities. 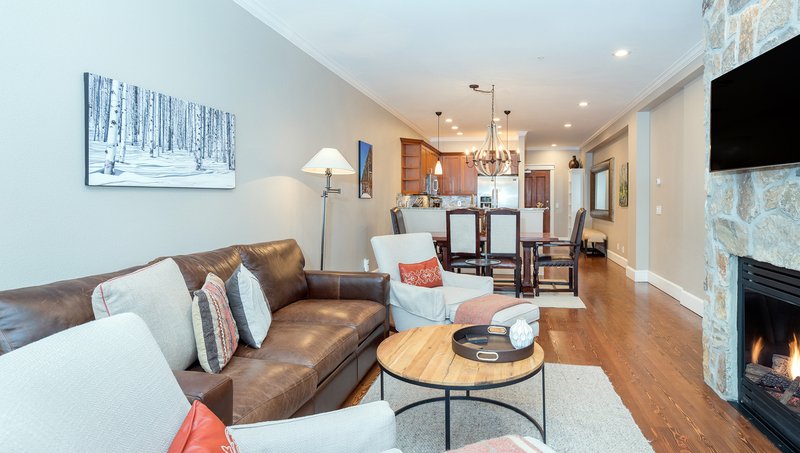 LAYOUT: This ground-floor residence has natural hardwood floors with an open floor-plan living room, dining area, and kitchen. 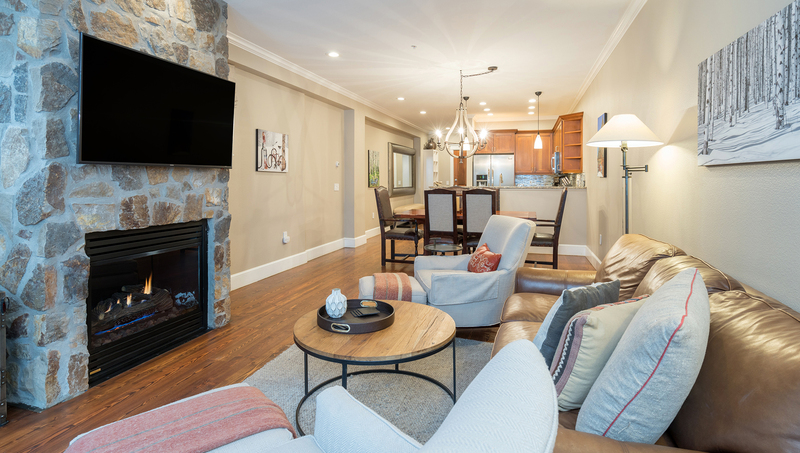 In the living room is a natural stone gas fireplace, wall-mounted flat-screen TV with Direct TV and DVD player. The leather sofa pulls out to a queen bed. This unit does not have a balcony. The dining table seats 6 with room to add bench seating. 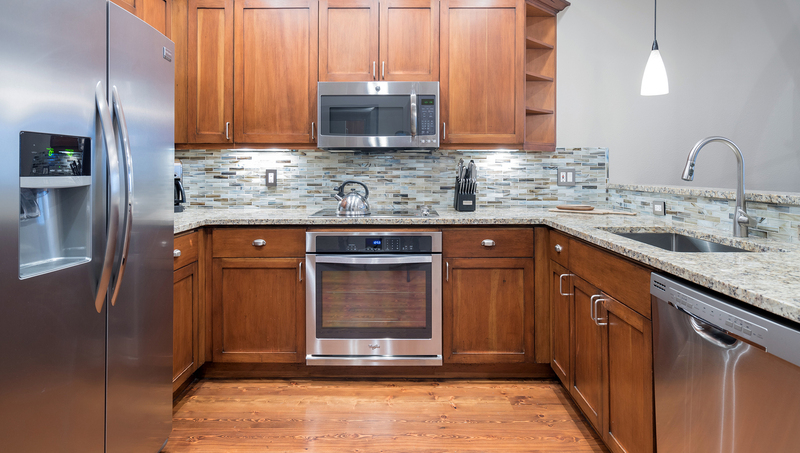 The kitchen is a fully equipped space with granite countertops, chef-quality appliances, and all the dishware, cookware, and utensils needed. In the master bedroom on the main level, there is a split king bed and flat-screen TV with DVD player. The en-suite bath has a steam shower and separate bathtub, large 2-sink vanity. Also on the main level is the bedroom with 2 twins bed (can be set up as king). The bathroom with shower/tub combo is outside the bedroom, accessible from the living area. This residence has its own washer/dryer, and complimentary wifi. 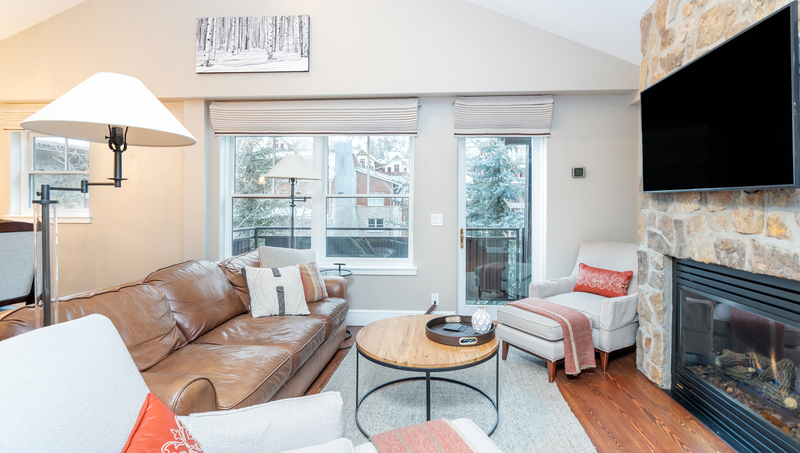 It is a pet-friendly unit: dogs only, limit 2, with advance notice, additional fees apply. PARKING: Garage parking is valet only, with one space per unit. SKI and GEAR STORAGE: Outdoor secure ski and snowboard storage is attended as well, with indoor boot-dryer racks available. Bikes and other gear can be securely stored in the garage. 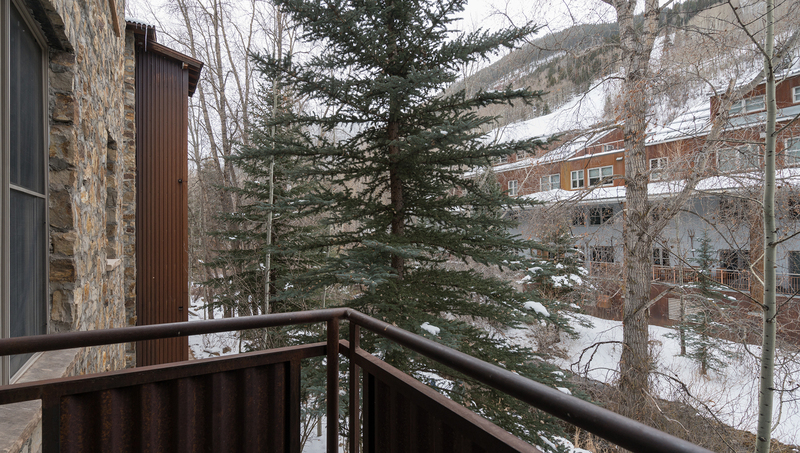 EXTRA AMENITIES: The River Club has a wonderful outdoor waterfall hot tub, open dawn to dusk daily during ski season, and between Memorial weekend and mid-October. 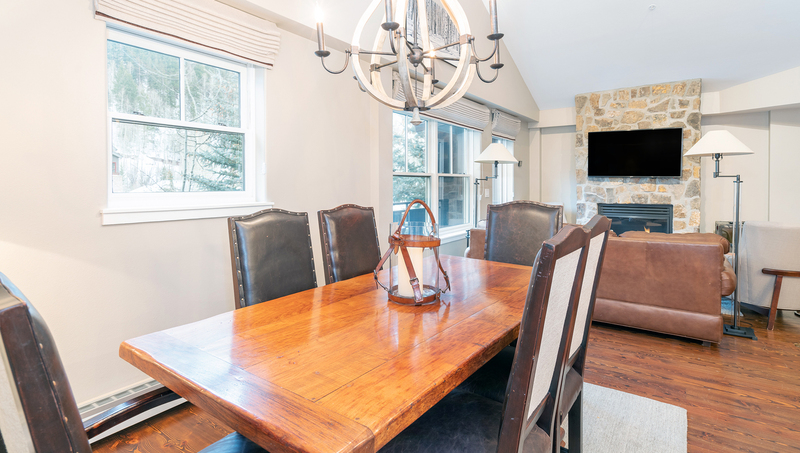 Also for your comfort and pleasure, there is a club room with a massive stone fireplace, sun room, and bar (coffee, tea, and special receptions). Downstairs, you'll find a desk area with computer, printer, and other business-support amenities. 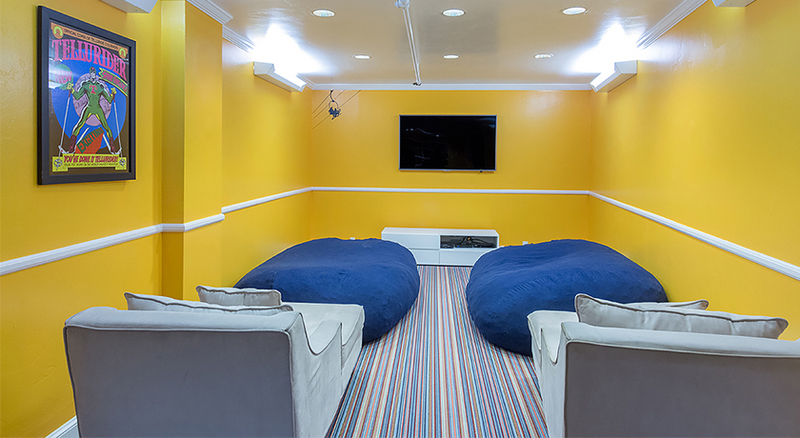 The Recreation Room is full of toys and games for children of all ages. And there's a Fitness Center with Nautilus equipment, stationery bicycles, treadmill, and free weights. 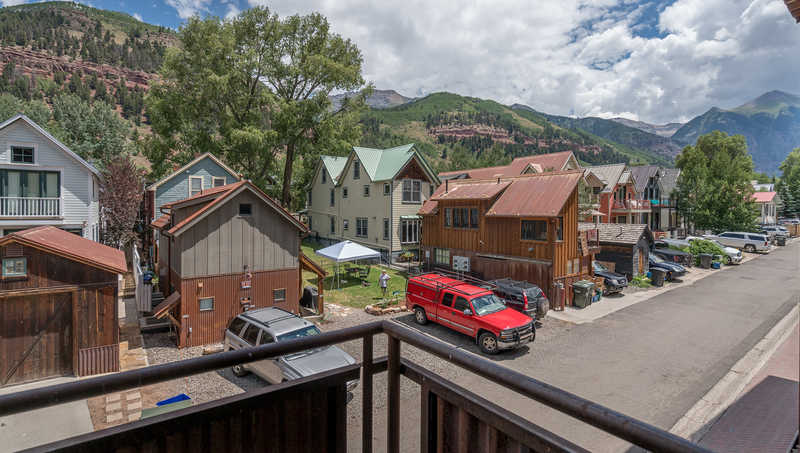 GROUND TRANSPORTATION: Your stay includes complimentary in-town transportation, and Telluride Airport shuttle service. Additional services to regional airports can be arranged through the delightful concierge staff. LAYOUT: This ground-floor residence has natural hardwood floors with an open floor-plan living room, dining area, and kitchen. 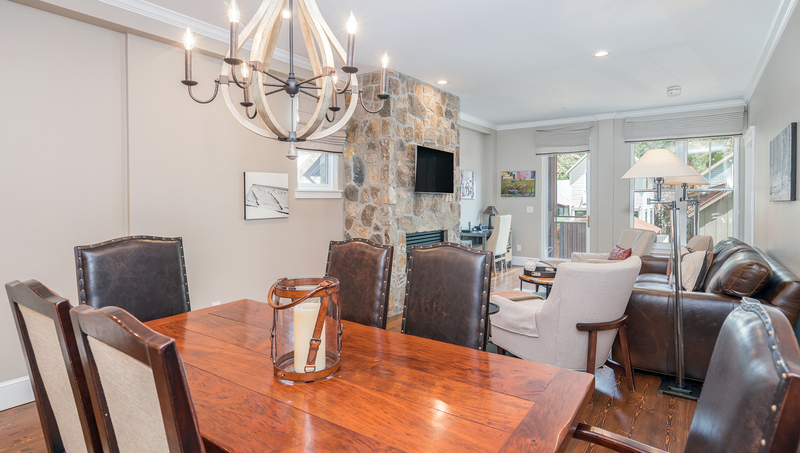 In the living room is a natural stone gas fireplace, wall-mounted flat-screen TV with Direct TV and DVD player. The leather sofa pulls out to a queen bed. This unit does not have a balcony. The dining table seats 6. 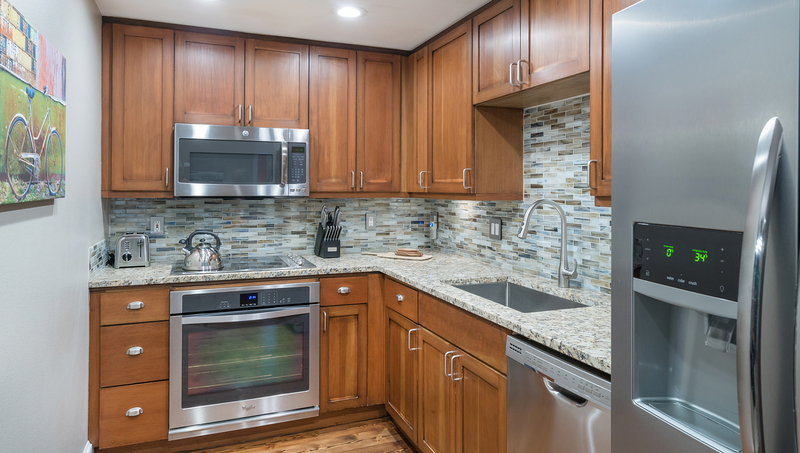 The kitchen is a fully equipped space with granite countertops, chef-quality appliances, and all the dishware, cookware, and utensils needed. In the master bedroom on the main level, there is a split king bed and flat-screen TV with DVD player. The en-suite bath has a steam shower and separate bathtub, large 2-sink vanity. Also on the main level is the bedroom with 2 twins bed (can be set up as king) with en-suite bathroom with shower/tub combo. 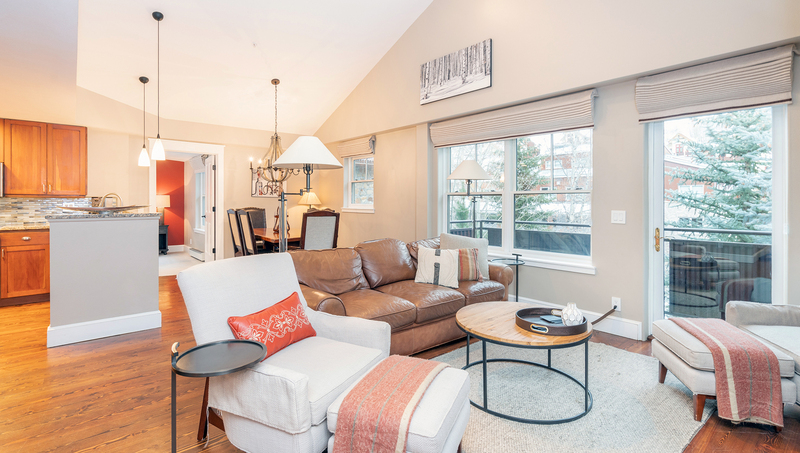 LAYOUT: This ground-floor residence has natural hardwood floors with an open floor-plan living room, dining area, and kitchen. 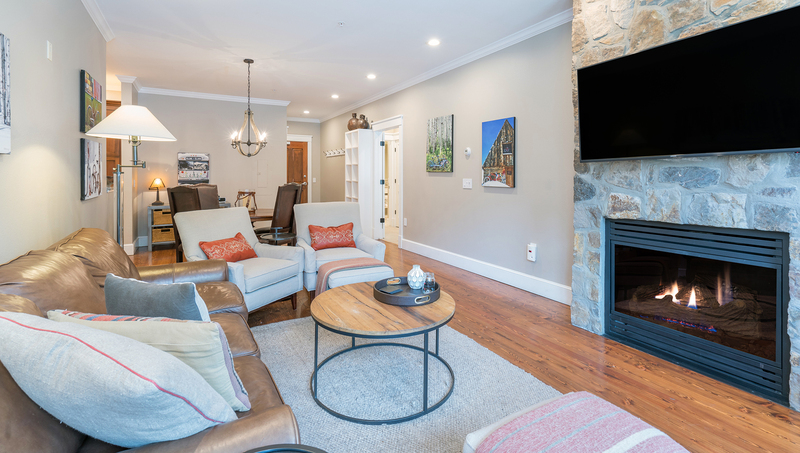 In the living room is a natural stone gas fireplace, wall-mounted flat-screen TV with Direct TV and Blu-Ray DVD player. The leather sofa pulls out to a queen bed. This unit has a balcony with views toward the river, and a small desk area. The dining table seats 6 with room to add bench seating. 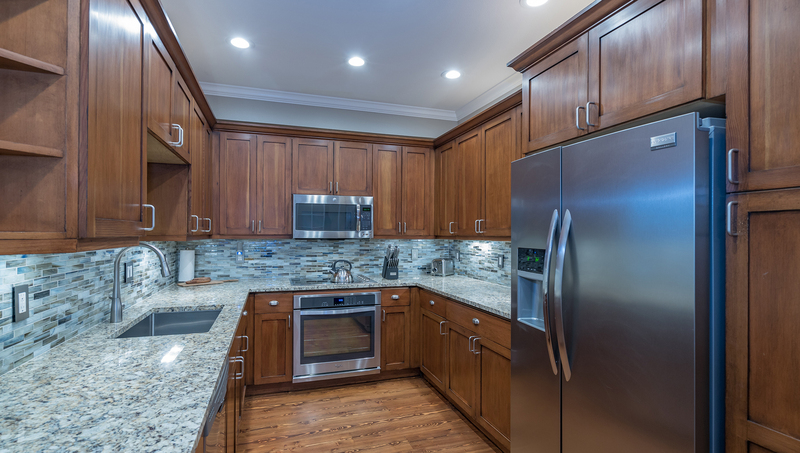 The kitchen is a fully equipped space with granite countertops, chef-quality appliances, and all the dishware, cookware, and utensils needed. In the master bedroom on the main level, there is a split king bed and flat-screen TV with DVD player. The bath has a jetted tub with shower, 2-sink vanity, and is accessible on the short hallway to the bedroom. Also on the main level is the bedroom with another split king bed, flat-screen TV with DVD player. The en-suite bathroom has a shower only. 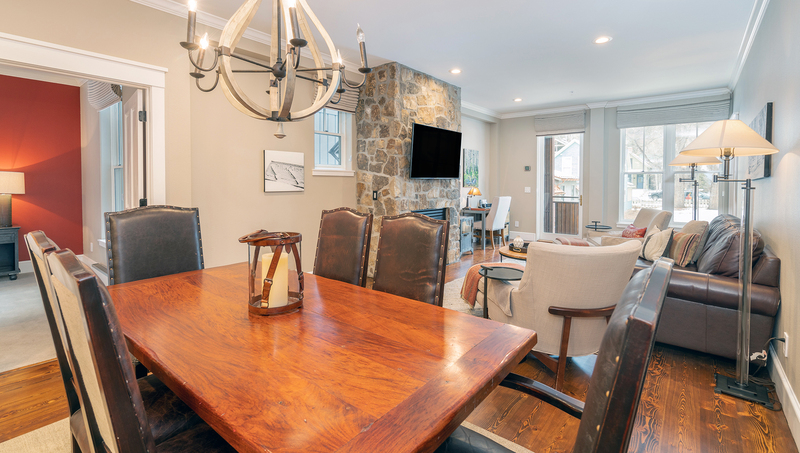 LAYOUT: This ground-floor residence has natural hardwood floors with an open floor-plan living room, dining area, and kitchen. 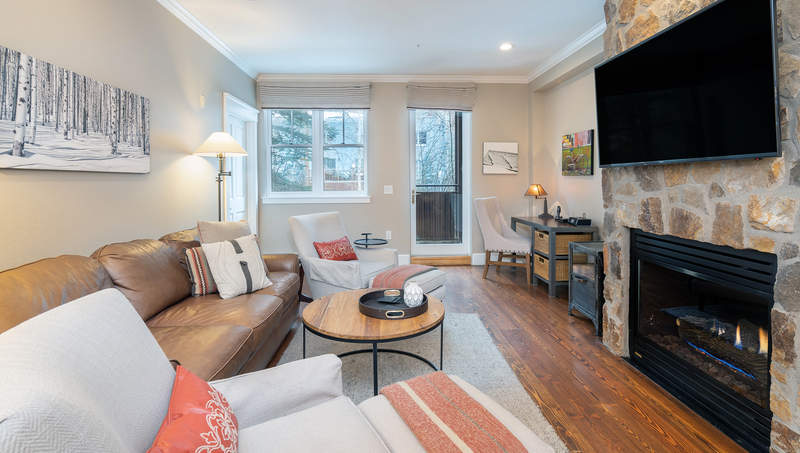 In the living room is a natural stone gas fireplace, wall-mounted flat-screen TV with Direct TV and Blu-Ray DVD player. The leather sofa pulls out to a queen bed. This unit does not have a balcony. The dining table seats 4. And there's a desk for a little workspace. 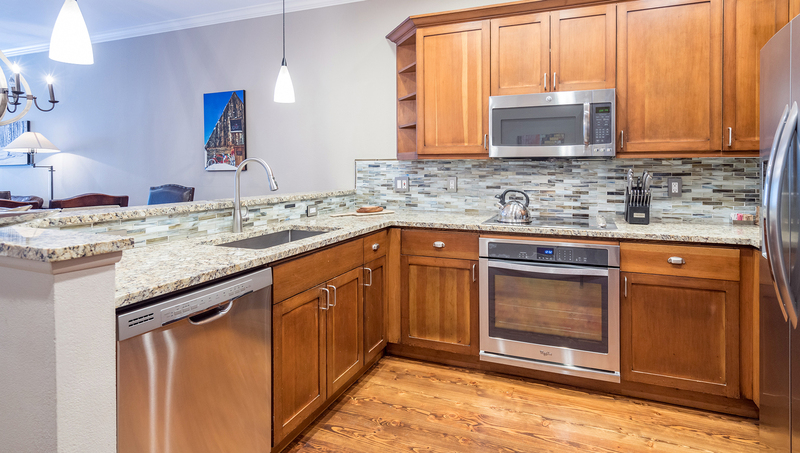 The kitchen is a fully equipped space with granite countertops, chef-quality appliances, and all the dishware, cookware, and utensils needed. In the master bedroom on the main level, there is a split king bed (can be set up as 2 twins) and flat-screen TV with DVD player. 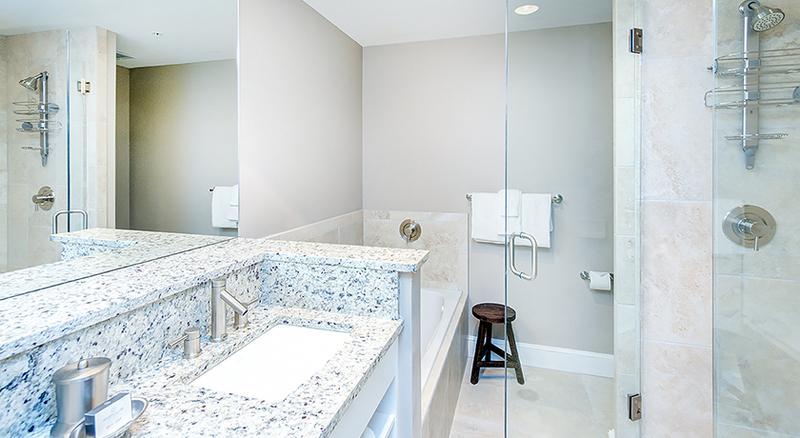 The en-suite bath has a steam shower and separate jetted tub, 2-sink vanity. Also on the main level is the bedroom with 2 twins bed (can be set up as king). The bathroom is en suite as well, with a shower only. LAYOUT: This residence is all on one level. 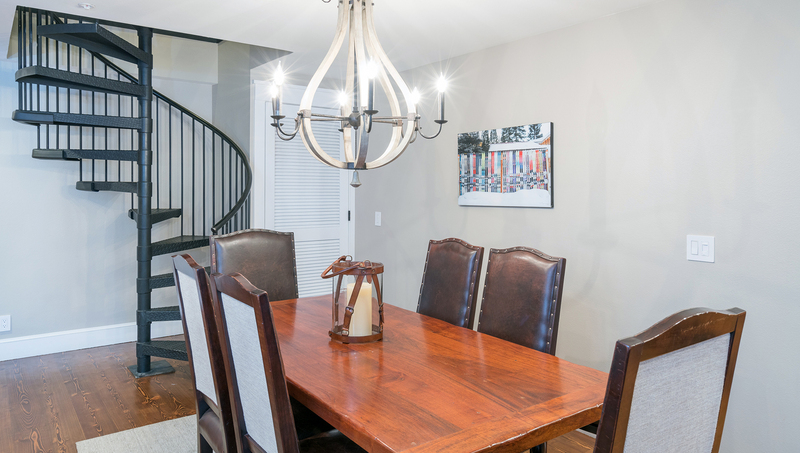 It has natural hardwood floors with an open floor-plan living room, dining area, and kitchen. 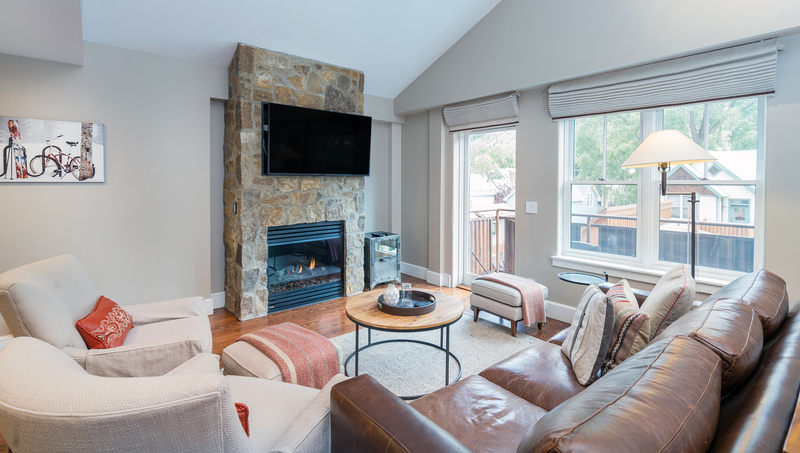 In the living room is a natural stone gas fireplace, wall-mounted flat-screen TV with Direct TV and DVD player. The leather sofa pulls out to a queen bed. Off the living room, the balcony opens to a town-side view. The dining table seats 6. 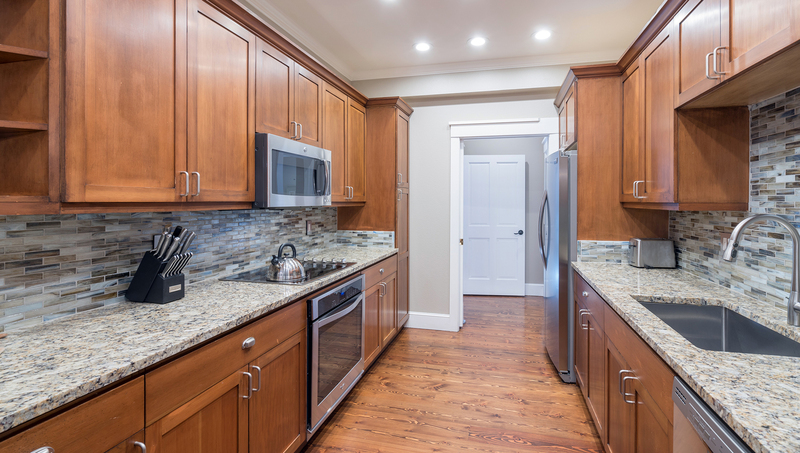 The kitchen is a fully equipped space with granite countertops, chef-quality appliances, and all the dishware, cookware, and utensils needed. In the master bedroom on the main level, there is a king bed (can be set up as 2 twins) and flat-screen TV with DVD player. The en-suite bath has a steam shower and separate bathtub, large 2-sink vanity. Also on the main level is the bedroom with 2 twin beds (can be set up as king). The bathroom with shower/tub combo is outside the bedroom, accessible from the living area. This residence has its own washer/dryer, and complimentary wifi. 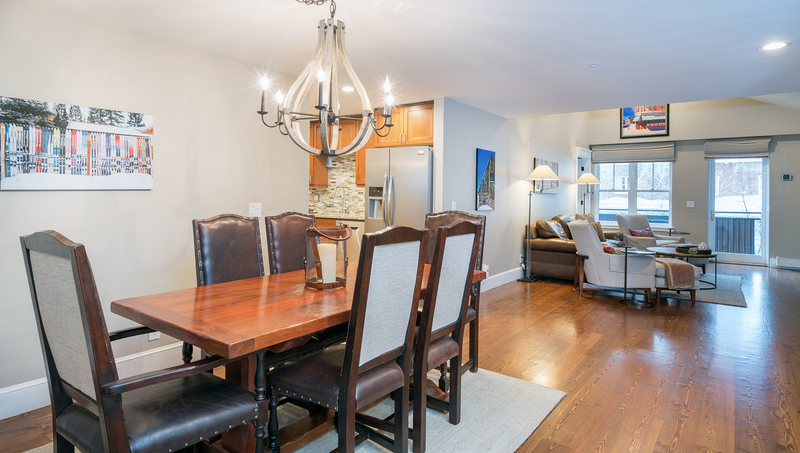 A great in-town location, this single-level condo comes with the Club's luxury amenities. 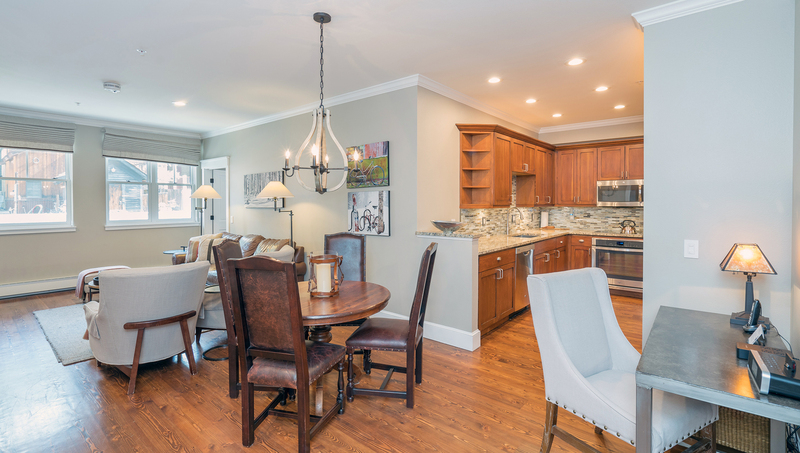 LAYOUT: This residence has natural hardwood floors with an open floor plan living room, dining area, and kitchen. 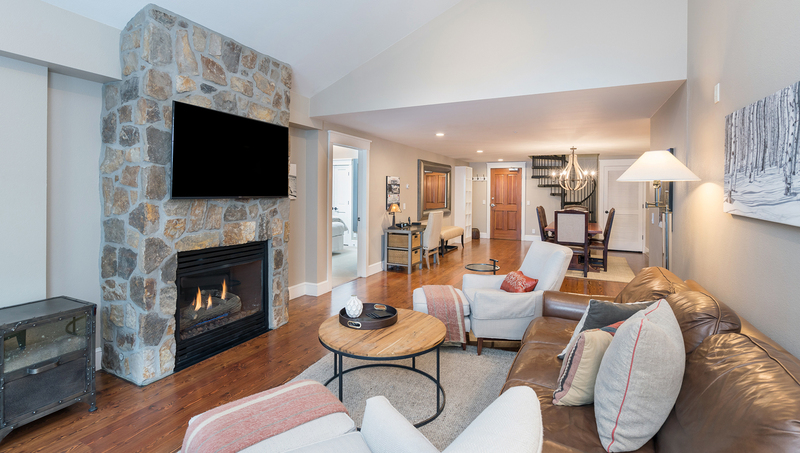 In the living room is a natural stone gas fireplace, wall-mounted flat-screen TV with Direct TV and Blu-Ray DVD player. The leather sofa pulls out to a queen bed. Off the living room, the balcony opens to a town-side view. The dining table seats 6 with room to add bench seating. 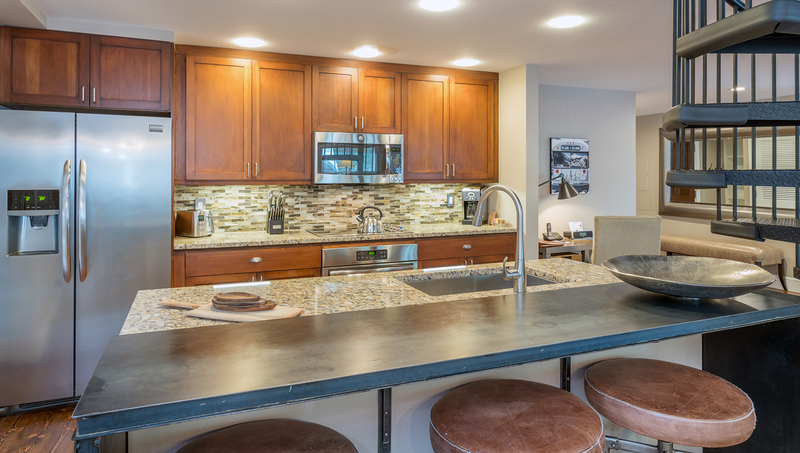 The kitchen is a fully equipped space with granite countertops, chef-quality appliances, and all the dishware, cookware, and utensils needed. In the master bedroom on the main level, there is a king bed (can be set up as 2 twins) and flat-screen TV with DVD player. The en-suite bath has a steam shower and separate bathtub, large 2-sink vanity. The second bedroom has a split king bed (can be set up as 2 twins), flat-screen TV and DVD player. The bathroom is accessible from the short hallway, just outside the bedroom; it has a jetted tub with shower. Also on the main level is the bedroom with queen bed, flat-screen TV with DVD player. The bathroom with shower only is en-suite. This residence has its own washer/dryer, and complimentary wifi. 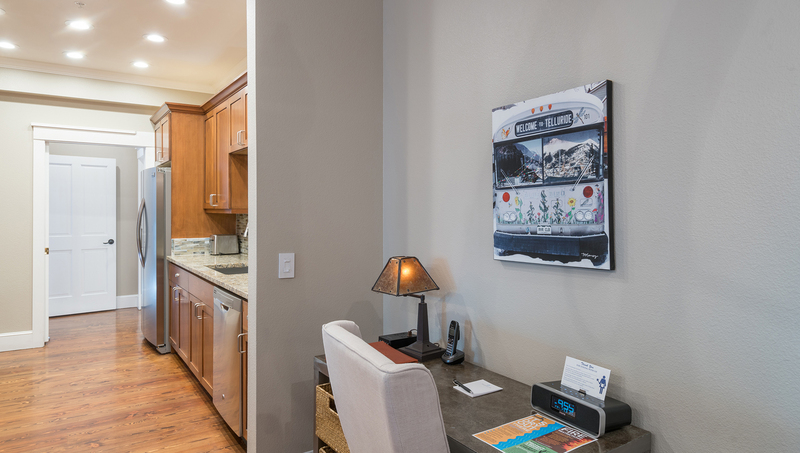 This unit is pet-friendly with a $30/night pet fee. 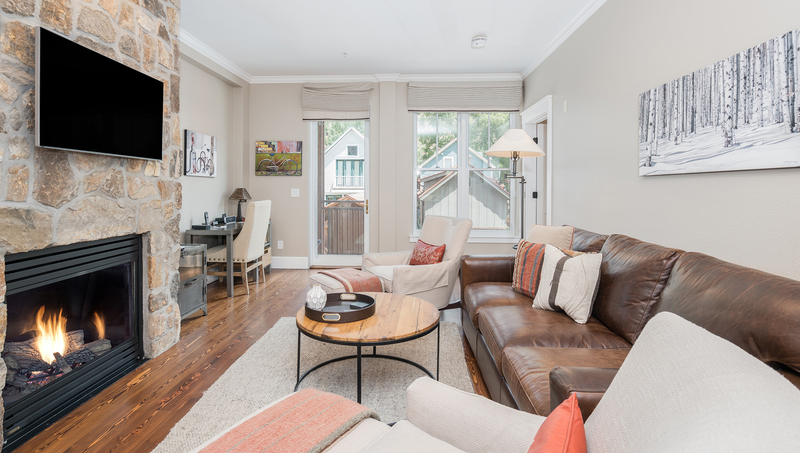 This 3-bedroom/3-bathroom residence has a great in-town location and luxury amenities. 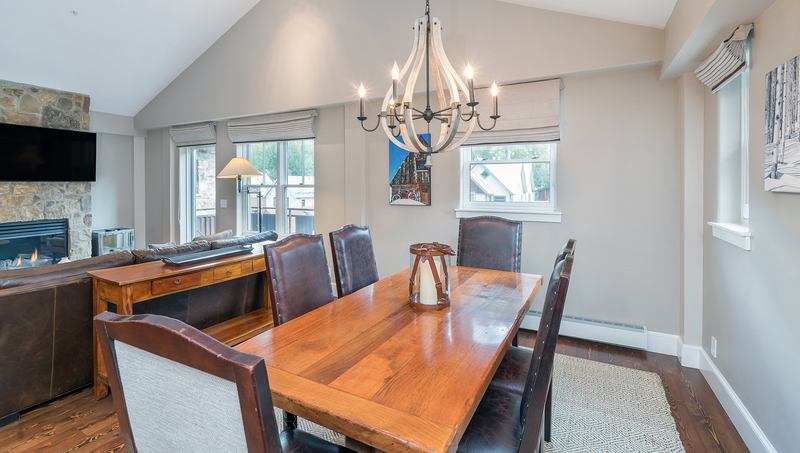 LAYOUT: This residence has natural hardwood floors with an open floor plan living room, dining area, and kitchen. 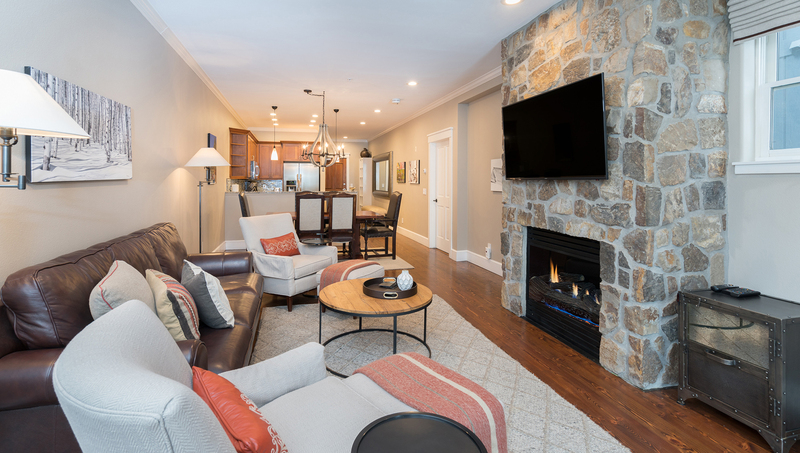 In the living room is a natural stone gas fireplace, wall-mounted flat-screen TV with Direct TV and DVD player. The leather sofa pulls out to a queen bed. Off the living room, the balcony opens to a town-side view. The dining table seats 6 with room to add bench seating. 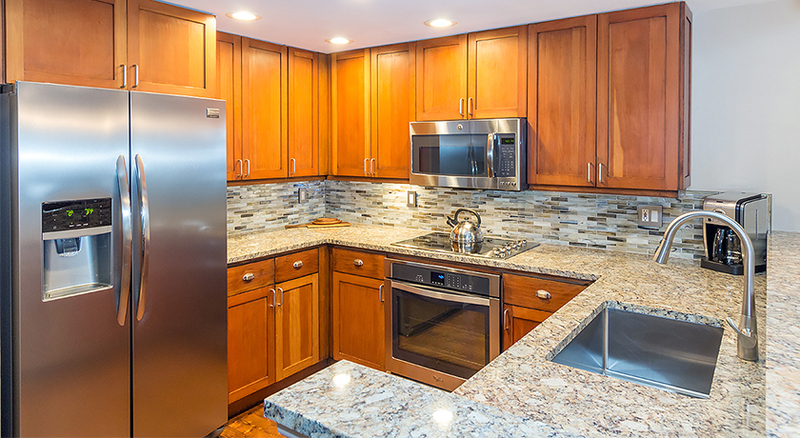 The kitchen is a fully equipped space with granite countertops, chef-quality appliances, and all the dishware, cookware, and utensils needed. In the master bedroom on the main level, there is a split king bed and flat-screen TV with DVD player. The en-suite bath has a steam shower and separate bathtub, large 2-sink vanity. The second bedroom has a king bed (can be set up as 2 twins) with an en-suite bath. Also on the main level is the bedroom with queen bed. The bathroom with shower/tub combo is outside the bedroom, accessible from the living area. 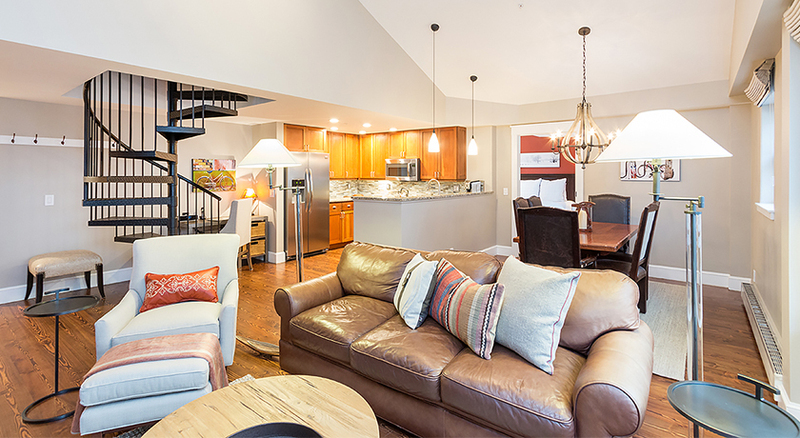 This 2-bedroom/2-bathroom residence comes with the River Club's luxury amenities. In the master bedroom on the main level, there is a split king bed and flat-screen TV with DVD player. The bath has a jetted tub with shower, 2-sink vanity, and is accessible on the short hallway to the bedroom. Also on the main level is the bedroom with another split king bed bed, flat-screen TV with DVD player. The en-suite bathroom has a shower only. LAYOUT: This top-floor residence has natural hardwood floors with an open floor-plan living room, dining area, and kitchen. 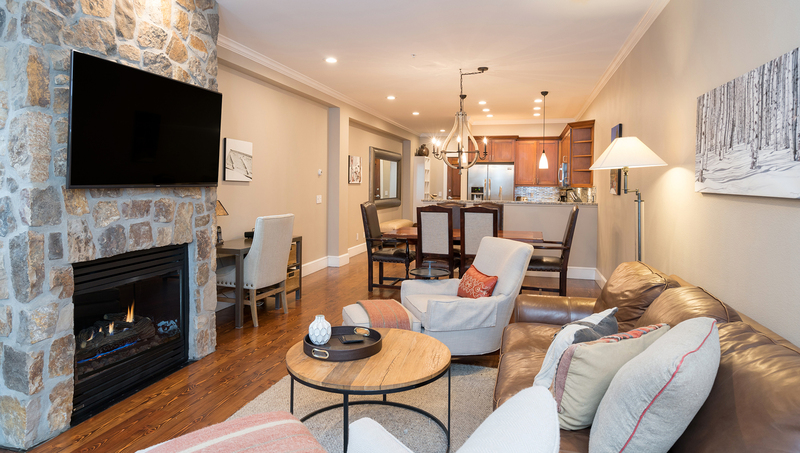 In the living room is a natural stone gas fireplace, wall-mounted flat-screen TV with Direct TV and DVD player. The leather sofa pulls out to a queen bed. The balcony enjoys a town-view. The dining table seats 6. 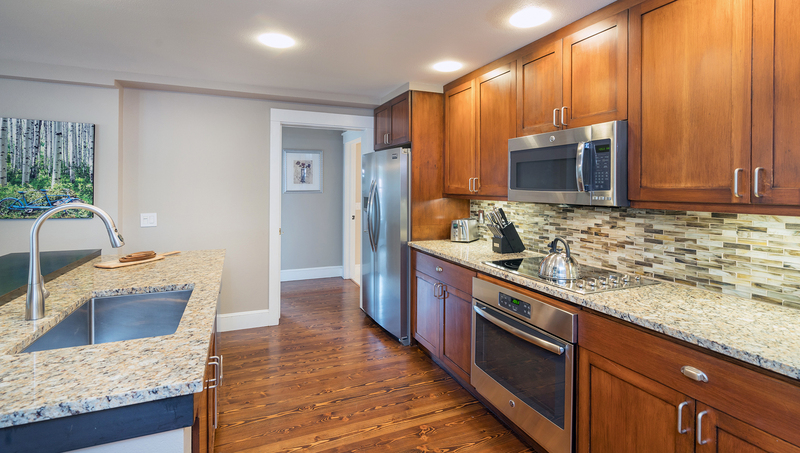 The kitchen is a fully equipped space with granite countertops, chef-quality appliances, and all the dishware, cookware, and utensils needed. 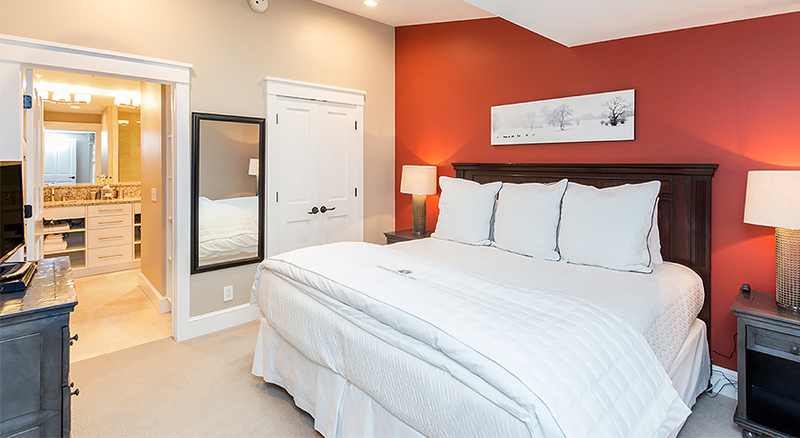 In the master bedroom, there is a king bed (can be set up as 2 twins) and flat-screen TV with DVD player. The en-suite bath has a steam shower and separate bathtub, large 2-sink vanity. The 2nd bedroom has 2 twins bed (can be set up as king). The bathroom, also en-suite, has a steam shower and separate bathtub. LAYOUT: This top-floor residence has natural hardwood floors with an open floorplan living room, dining area, and kitchen. 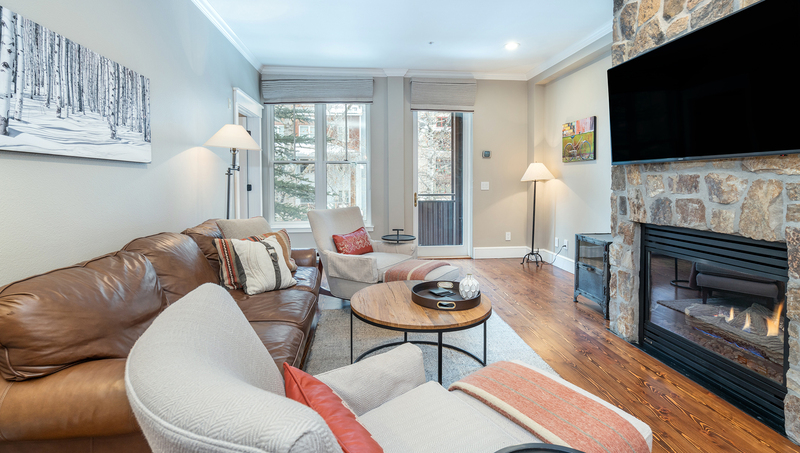 In the living room is a natural stone gas fireplace, wall-mounted flat-screen TV with Direct TV and DVD player. The leather sofa pulls out to a queen bed. Off the living room, the balcony opens to a town-side view. The dining table seats 6 with room to add bench seating. 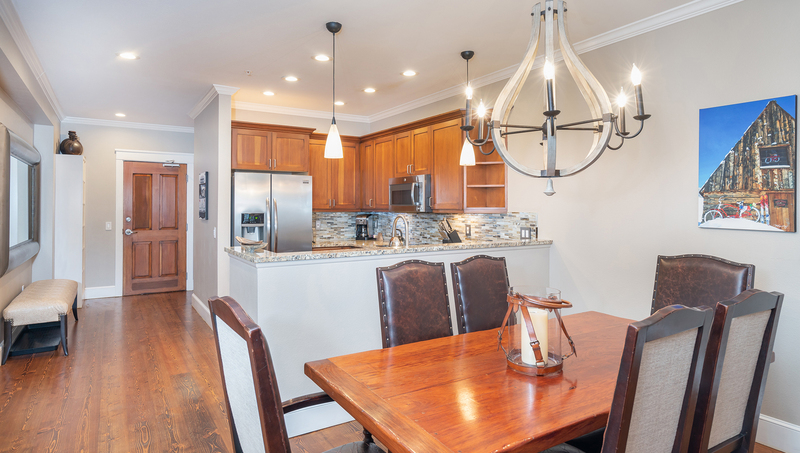 The kitchen is a fully equipped space with granite countertops, chef-quality appliances, and all the dishware, cookware, and utensils needed. 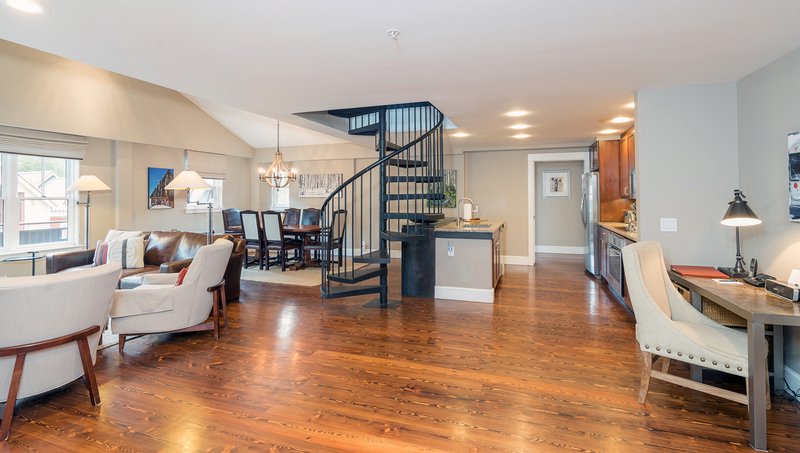 Up the spiral stairs is a bedroom with queen bed, private bath with jetted tub, and flat-screen TV with DVD player. There is not a door closing the room off from the main level. In the master bedroom on the main level, there is a split king bed and flat-screen TV with DVD player. The en-suite bath has a steam shower and separate bathtub, large 2-sink vanity. Also on the main level is the bedroom with another split king bed. The bathroom with shower/tub combo is outside the bedroom, accessible from the living area. LAYOUT: This top-floor residence has natural hardwood floors with an open floor plan living room, dining area, and kitchen. 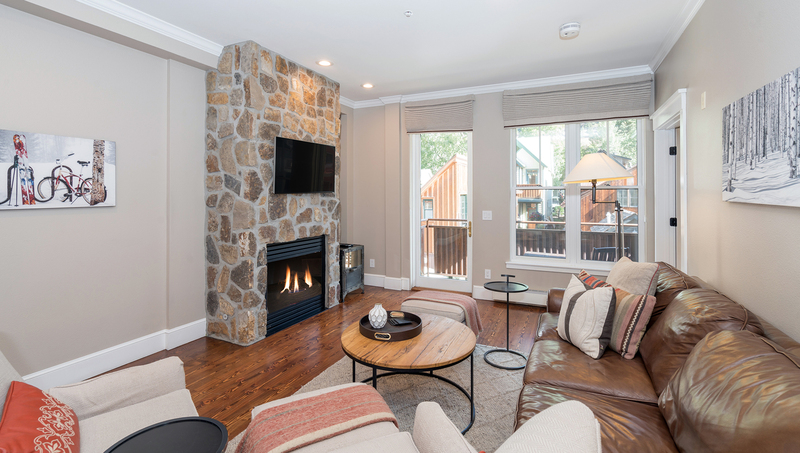 In the living room is a natural stone gas fireplace, wall-mounted flat-screen TV with Direct TV and DVD player. Off the living room, the balcony opens to a town-side view. The dining table seats 6 with room to add bench seating. 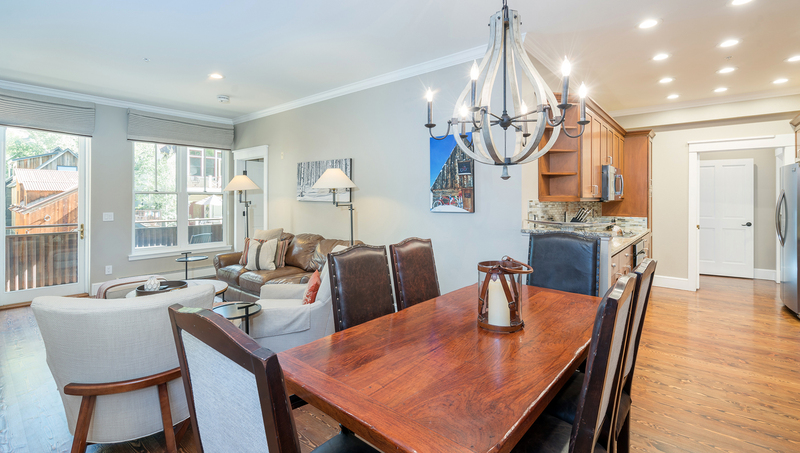 The kitchen is a fully equipped space with granite countertops, chef-quality appliances, and all the dishware, cookware, and utensils needed. 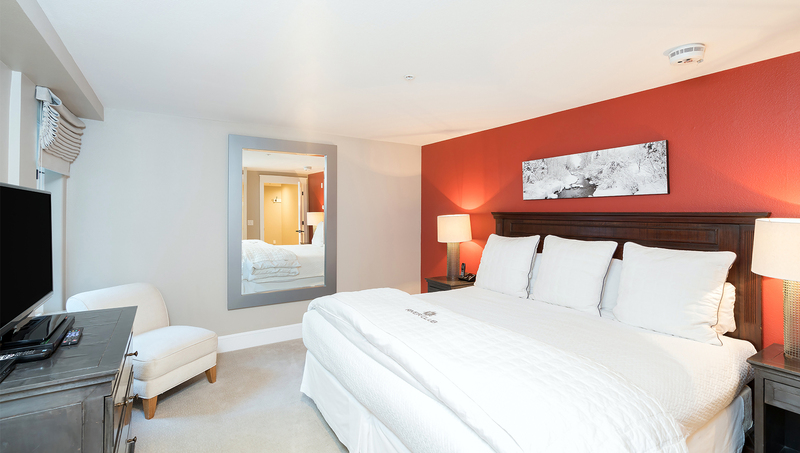 In the master bedroom on the main level, there is a split king bed and flat-screen TV with DVD player. The en-suite bath has a steam shower and separate bathtub, large 2-sink vanity. Also on the main level is the bedroom with king bed (can be set up as 2 twins). The bathroom with shower/tub combo is outside the bedroom, accessible from the living area. LAYOUT: This top-floor residence has natural hardwood floors with an open floor plan living room, dining area, and kitchen. 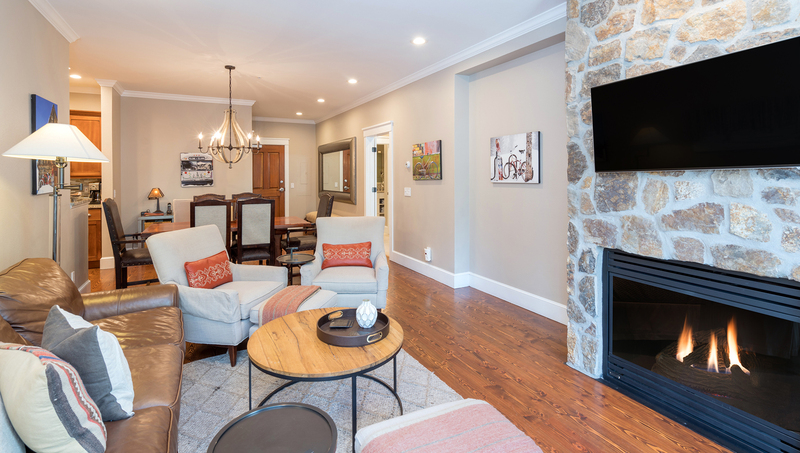 In the living room is a natural stone gas fireplace, wall-mounted flat-screen TV with Direct TV and DVD player. The leather sofa pulls out to a queen bed. Off the living room, the balcony opens to a town-side view. The dining table seats 6 with room to add bench seating. 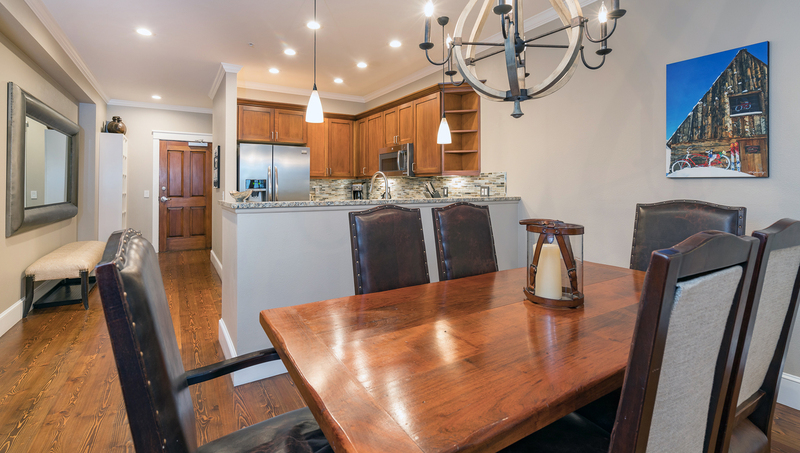 The kitchen is a fully equipped space with granite countertops, chef-quality appliances, and all the dishware, cookware, and utensils needed. In the master bedroom on the main level, there is a king bed (can be set up as 2 twins) and flat-screen TV with DVD player. The en-suite bath has a steam shower and separate bathtub, large 2-sink vanity. Also on the main level is the bedroom with 2 twins (can be made into king bed). The bathroom with shower/tub combo is outside the bedroom, accessible from the living area. LAYOUT: This top-floor residence has natural hardwood floors with an open floor plan living room, dining area, and kitchen. 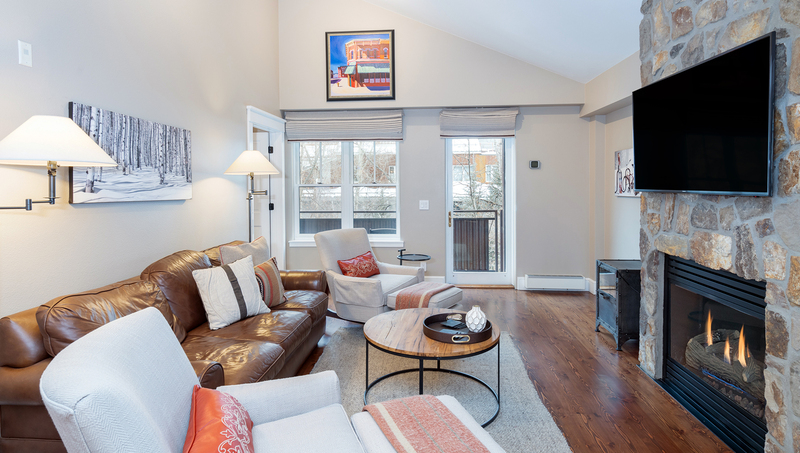 In the living room is a natural stone gas fireplace, wall-mounted flat-screen TV with Direct TV and DVD player. Off the living room, the balcony opens to a river-side view. The dining table seats 6 with room to add bench seating. 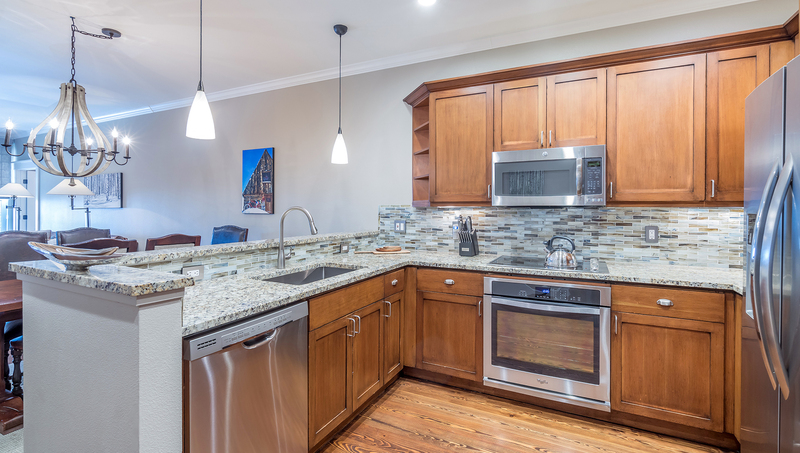 The kitchen is a fully equipped space with granite countertops, chef-quality appliances, and all the dishware, cookware, and utensils needed. 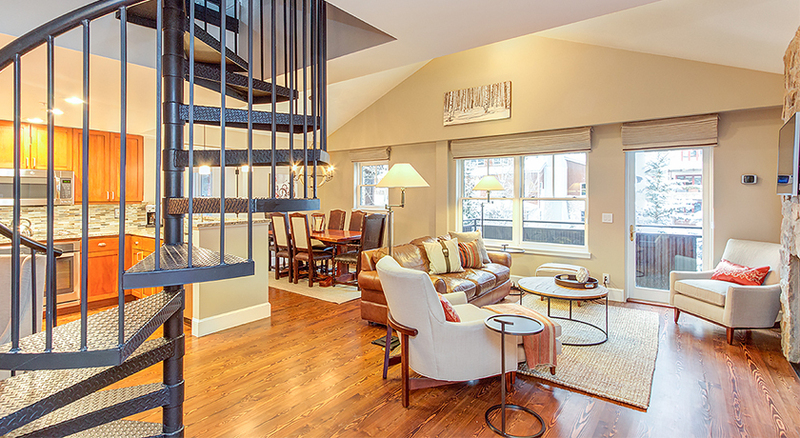 Up the spiral stairs is a bedroom with a queen bed, private bath with jetted tub, and flat-screen TV with DVD player. There is not a door closing the room off from the main level. In the master bedroom on the main level, there is a king bed (can be set up as 2 twins) and flat-screen TV with DVD player. The en-suite bath has a steam shower and separate bathtub, large 2-sink vanity. Also on the main level is the bedroom with split king bed with an en-suite bathroom with shower/tub combo is outside the bedroom. LAYOUT: This top-floor residence has natural hardwood floors with an open floor plan living room, dining area, and kitchen. 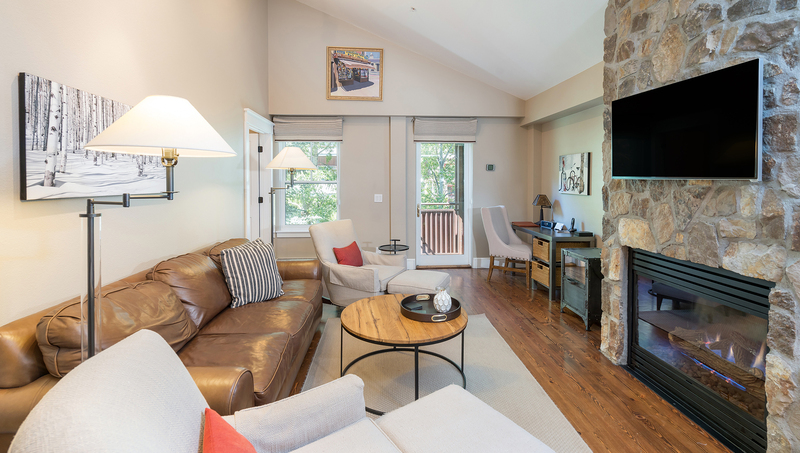 In the living room is a natural stone gas fireplace, wall-mounted flat-screen TV with Direct TV and DVD player. The leather sofa pulls out to a queen bed. Off the living room, the balcony opens to a river-side view. The dining table seats 6 with room to add bench seating. 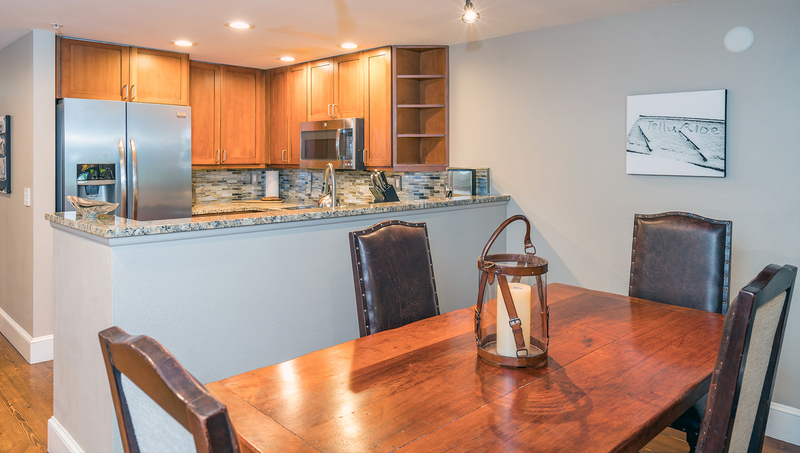 The kitchen is a fully equipped space with granite countertops, chef-quality appliances, and all the dishware, cookware, and utensils needed. LAYOUT: This top-floor residence has natural hardwood floors with an open floorplan living room, dining area, and kitchen. 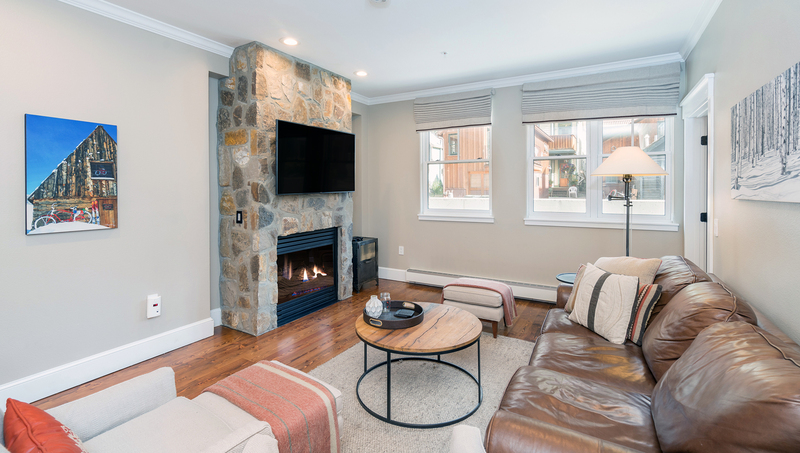 In the living room is a natural stone gas fireplace, wall-mounted flat-screen TV with Direct TV and Blu-Ray DVD player. The leather sofa pulls out to a queen bed. Off the living room, the balcony opens to a river-side view. The dining table seats 6 with room to add bench seating. 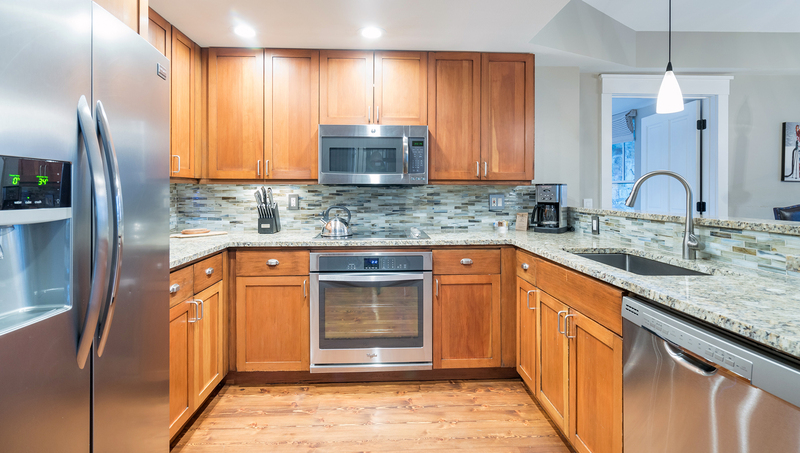 The kitchen is a fully equipped space with granite countertops, chef-quality appliances, and all the dishware, cookware, and utensils needed. 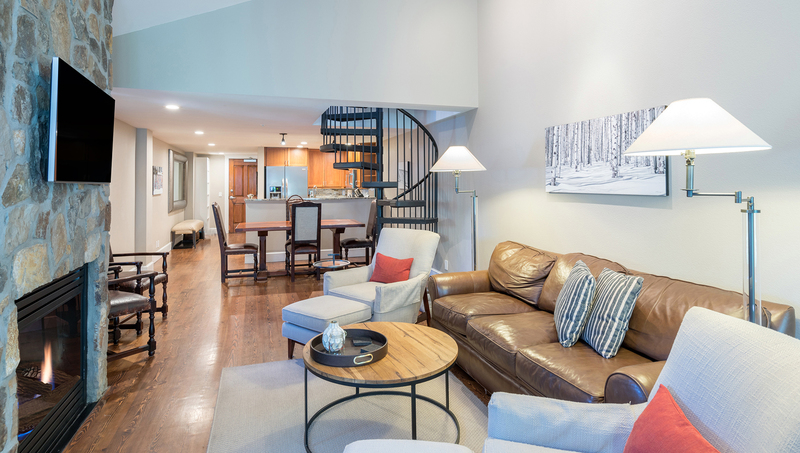 Up the spiral stairs is a bedroom with queen bed, private bath with shower, and flat-screen TV with DVD player. There is not a door closing the room off from the main level. In the master bedroom on the main level, there is a king bed (can be set up as 2 twins) and flat-screen TV with DVD player. The en-suite bath has a jetted tub with separate shower, large 2-sink vanity. Also on the main level is the bedroom with 2 twin beds (can be set up as king bed), flat-screen TV with DVD player. The bathroom is en suite, with a steam shower and separate bathtub. 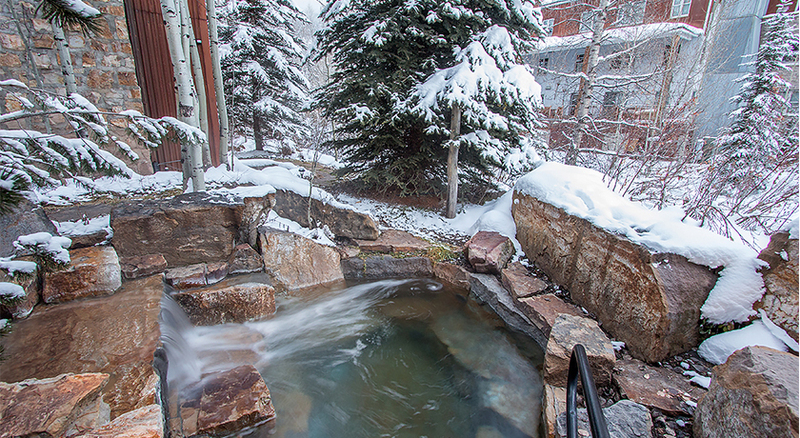 EXTRA AMENITIES: The River Club has a wonderful outdoor waterfall hot tub, open daily during ski season, and between Memorial weekend and mid-October. 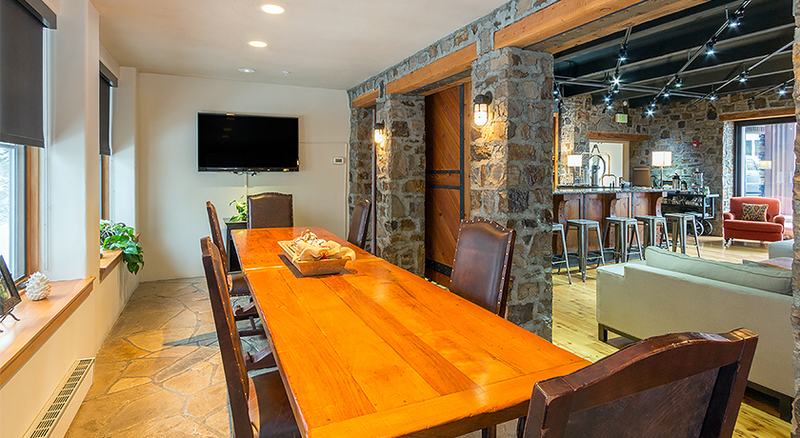 Also for your comfort and pleasure, there is a club room with a massive stone fireplace, sun room, and bar (coffee, tea, and special receptions). Downstairs, you'll find a desk area with computer, printer, and other business-support amenities. 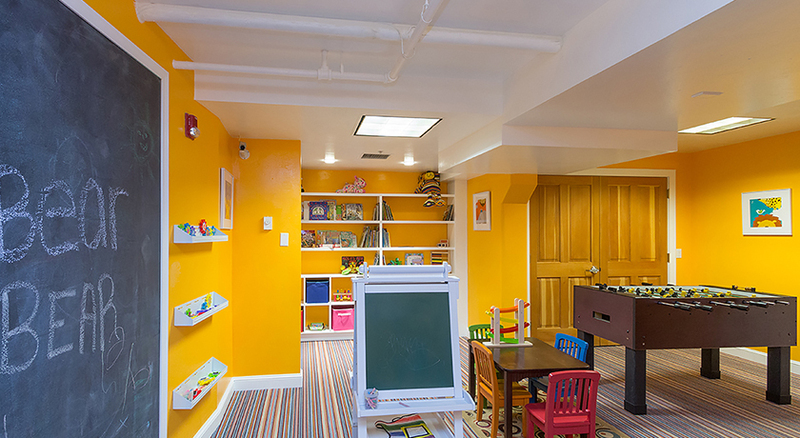 The Recreation Room is full of toys and games for children of all ages. 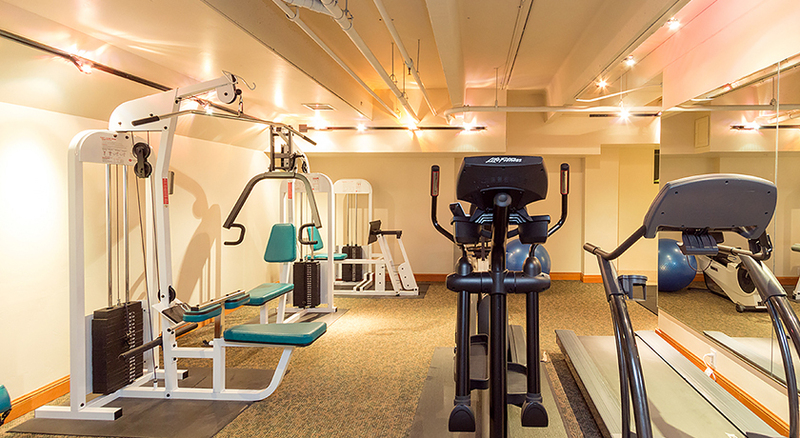 And there's a Fitness Center with Nautilus equipment, stationery bicycles, treadmill, and free weights. LAYOUT: This top-floor residence has natural hardwood floors with an open floor-plan living room, dining area, and kitchen. 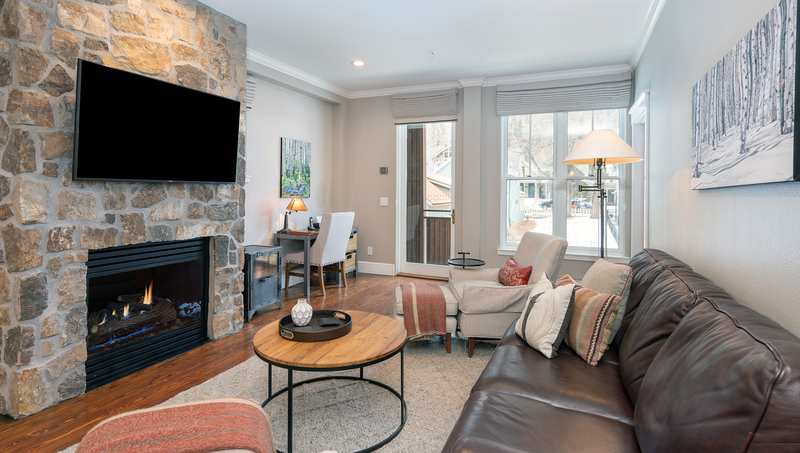 In the living room is a natural stone gas fireplace, wall-mounted flat-screen TV with Direct TV and DVD player. The leather sofa pulls out to a queen bed. This unit does not have a balcony. The dining table seats 6. 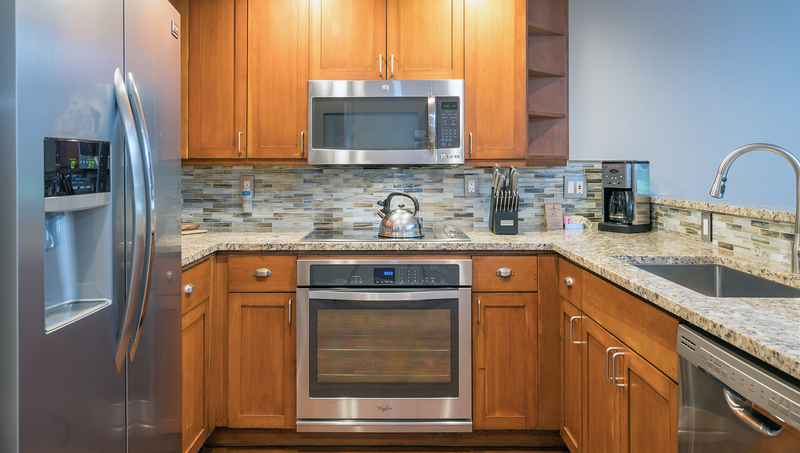 The kitchen is a fully equipped space with granite countertops, chef-quality appliances, and all the dishware, cookware, and utensils needed.